If I had been a good blogger I might have mentioned this before it happened, but as I have been pretty much injecting nostalgia straight into my veins with EverQuest, Diablo, and Lord of the Rings Online for most of the month, this sort of slipped by. 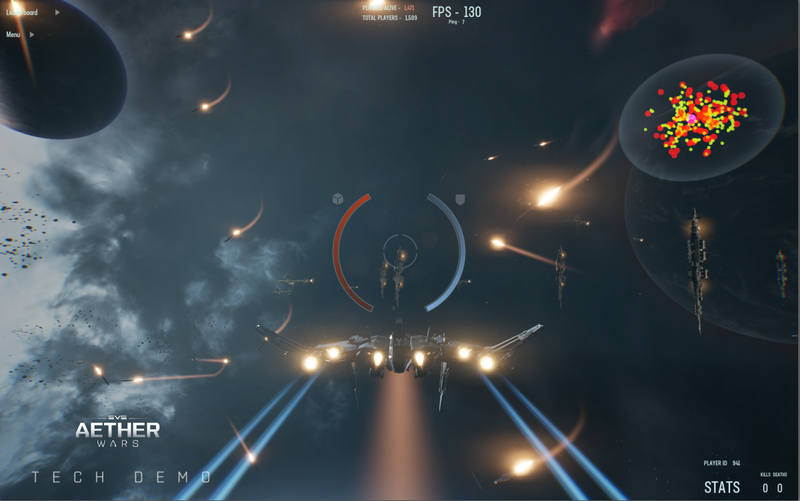 Earlier this month CCP put out a dev blog about EVE Aether Wars, a tech demo they were going to hold during the Game Developers Conference, which is also running this week. 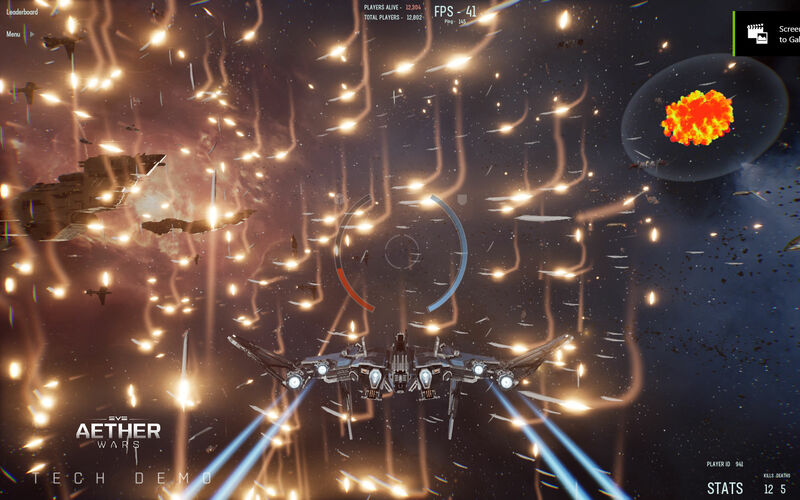 The basic idea was that CCP would be working with a company called Hadean to use their Aether Engine for a huge space battle tech demo to help demonstrate the possible usefulness of the engine for supporting such mass battle content… and maybe pick up a Guinness Book record along the way. The target was to get 10,000 players together to drive this tech demo. CCP and EVE Online are, of course, no strangers to mass battles. Huge player battles and people behaving badly are the two things that have traditionally gotten EVE Online their press coverage, though the latter has tapered off somewhat in recent years. I think Judgement Day was the last big newsworthy bit of betrayal. But big battles, those are more common and yet still manage to get coverage in the gaming press, coverage which often leaks out into the mainstream press. And CCP has received recognition from Guinness for last year’s Million Dollar Battle which peaked at 6,142 players. That number, however, was about all the game could handle… and I use the word “handle” in the most liberal fashion. 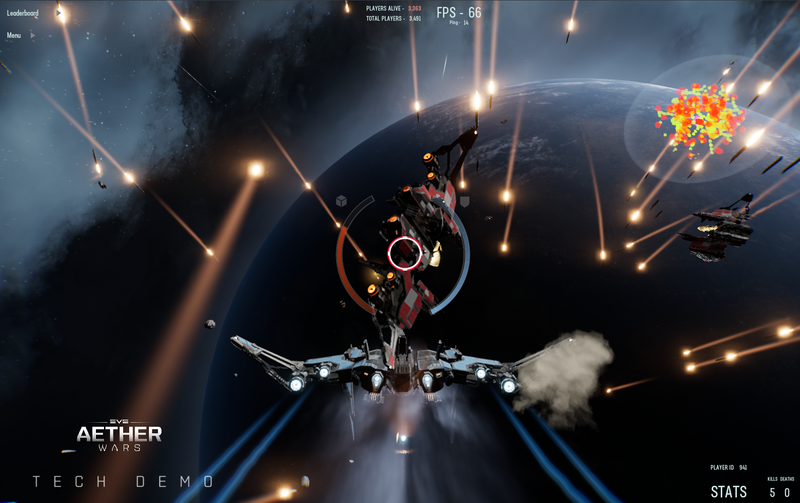 Being in that battle, like any such huge battle, means playing in molasses with time dilation slowing things down to 10% speed and controls becoming unresponsive and people being disconnected regularly. So CCP is clearly an ideal customer for anything than would make this better. On Hadean side, their Aether Engine is a cloud based system to rope together servers to support the processing power needed to keep a huge battle going. The details are scant, as one might expect, but some of the information about their operating system is covered by, or linked to, in the FAQ about the event. People could sign up for the test, which was set to go yesterday at 17:30 UTC. I signed up, grabbed the 700MB download for the client, and awaited the promised login key. There were plenty of warnings about this not being a full fledged game. The controls were very simple, being pretty much “press W to accelerate” and “click the mouse button to shoot” with mouse input to steer your way. But I still wasn’t sure what to expect. After a bit of delay I was able to get into the demo at 18:00 UTC and found myself in space. The feel was very much that of EVE Valyrie. You were dropped into a single player ship and used the mouse to point where you wanted to go. There were shield and armor indicators to right and left that showed your ship’s health. 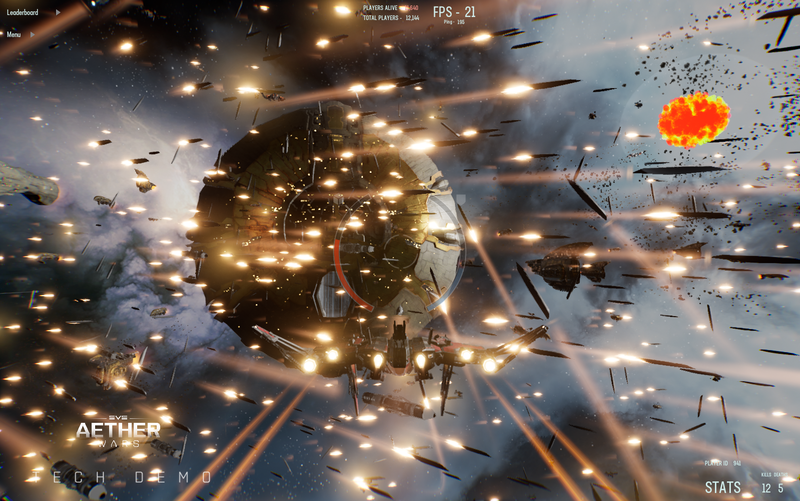 The backdrops in space were from EVE Online, but the action itself was nothing akin to that. You had to find other players… that blob in the upper right was some sort of mini-map/proximity guide but wasn’t much help… get them in your targeting reticle until they were locked, at which point you could launch a missile at them. Then rinse and repeat. Not exactly exciting. It was a mass of people shooting at each other. To aim it was much better to slow down to get things in your sights, and if you started taking hits it was time to accelerate and turn to avoid the incoming. I managed to get a few kills. You had to pound somebody with quite a few missiles in order to kill them outright, so I am sure some of my targets had been softened up by others. Likewise, I am sure I served up some ready kills to others as it seemed to be the usual routine of the killing blow getting the credit. However, after about 15 minutes it became clear that we were not going to get 10,000 people in the demo. The numbers stopped climbing past the 3,500 mark. So Hadean dumped in some AI pilots to make up the balance. At that point the sky was alive with missiles, oddly seeming to flow in the same direction like a school of fish. I suspect the uniform missile behavior was related to the AI players. They seemed to have guided missiles, judging by how they would all turn together mid-flight. When the AIs decided you were a target it seemed likely you were going to die. Not that being blown up was all that painful. You just respawned back into the match in a fresh ship. When the AI players became active, that was when the client actually began to get bogged down. At least that was like an EVE Online fight. The FPS meter, which had been into three digits for much of the time, fell way down, running between 15 and 45 FPS depending on where I was pointed. The client also crashed a few times, though launching and getting back in the game was quick enough. In the end it wasn’t much of a game… perhaps too simple for my jaded tastes in this day and age… but it wasn’t meant to be. As a tech demo it was interesting. The game itself seemed to be able to keep up with the mass of players without having to resort to slowing people down in order to keep up. I have no idea how much hardware was required behind the scenes to make that possible, but I imagine that it was not trivial. A total of 88,988 ships destroyed. A colossal 14,710,908 torpedoes fired. There is a promise of more play tests to come in order to help test out the technology. We will see if maybe, some day, this tech will trickle down into EVE Online in order to make fleet fight there less of a slog. This entry was posted in entertainment, EVE Online, Null Sec and tagged EVE Aether Wars, Guinness World Records, Hadean on March 21, 2019 by Wilhelm Arcturus.